Studies have shown that poor performance of e-commerce web sites can directly result in loss of revenue, poor customer satisfaction and damaged reputation. According to Forrester Research, users expect pages to load in under two seconds. Forty percent of users will abandon a site if page load time is over three seconds. Researchers found that a one-second delay in Microsoft Bing search results will cause a two percent drop in revenue; a two-second delay increases the loss to 4.3 percent. According to a New York Timesreport, a delay of even the blink of an eye — about 400 milliseconds — is too long for impatient users. Furthermore, poor user experience or performance is not always predictable. For example, when your business requires optimal performance during peak shopping times, your application could become unstable or perform poorly due to the increased number of visitors. This unpredictability in performance translates into operational business risk that companies must account for. 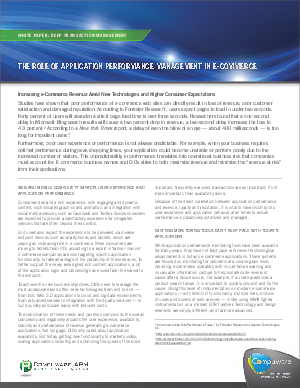 E-commerce business owners and CIOs strive to both maximize revenue and minimize the “revenue at risk” from their applications.